The photography book remains the foremost delivery system of a photographer’s vision. In the book the sum equals more than the parts. In the world of photography all the leading practitioners have made their work and their names known by way of a major publication. 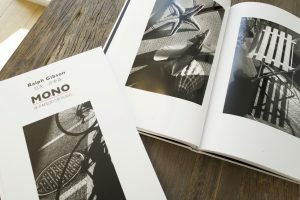 For many serious photographers, however, the book is a goal difficult to realize. Often the technical steps in making a book remain a mystery. This 4-day workshop and will deal with all aspects of the book making process. We will focus on the book “dummy” as an object in and of itself. An object developed to the level of presentation for final publication. Aspects of layout, design, double-page spreads, book cover impact and editorial thrust as well as binding, typography, separation for plate-making, distribution formulas and more will be addressed. Workshop participants will have the opportunity to view books by Ralph Gibson and their hand-made dummies, created via this same process. Ralph’s position has always been that an accurate facsimile of the book intended for publication is the optimum approach. Ralph strongly believes that these are the golden years of the photography book. This workshop is designed to help you explore the process with guidance from a true master of the craft. The process of creating a final book dummy, informs the photographer as to the exact content of his/her book as well as shows the potential publisher exactly what is being offered for publication. In this manner the editing comes after the idea of the book is made, not before. 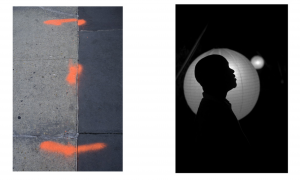 It is a strong step towards the autonomy of the photographer in an otherwise very amorphous and confusing world. The world of photography book publishing. 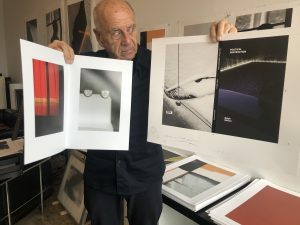 To date, Ralph Gibson has produced more than 50 books in this manner. This workshop will outline, step by step, exactly how a book is created, produced and distributed. Beginning with the most basics of layout, design, typography and content the members of the workshop will all produce a 16 or 32 page ” signature” of their work in place; scaled and printed and bound. The members of the workshop need to bring 20 or more jpegs. of their project as well as a laptop computer loaded with a layout program such as InDesign or Lightroom or Preview. A basic knowledge of the program is required to the extent that the photographer can import and scale his or her images on the page. These 2 page spreads will be then assembled into 16 page signatures. Once in the hand the flow, rhythm and tactility of the ” book” becomes apparent. This experience is a rare opportunity to work with a true master of the fine art photography book. This workshop will be ideal for intermediate to advanced photographers with a project or collection of images they feel could make a book. Having a collection of images and interest in receiving constructive feedback are prerequisites. Come prepared knowing how to explain your book concept, your goals, and what you are looking to get out of this experience. We will work with both Lightroom and InDesign to print our your book layout for editing. Having a basic knowledge of these programs will be helpful. We will have onsite technical support from nationally recognized fine art printing expert Eric Joseph. Enrollment is limited to only 12 participants. Coffee and snacks will be provided throughout. A catered with Ralph with be provided on the final day of the final day of the program. Lodging is not included in the workshop fee. Ralph Gibson (b.1939) studied photography in the US Navy and further pursued the medium at the San Francisco Art Institute in the early 1960’s. Gibson went on to assist Dorothea Lange and later, Robert Frank on two of his films, launching his professional career. Having a strong interest in books and book-making, he founded his own publishing company, Lustrum Press out of New York and went on to create his trilogy, The Somnambulist, Deja Vu, and Days at Sea which were instant hits and helped solidify his mark as a key player in 20th century photography. Gibson’s photographs are in many important museum collections and have been shown in hundreds of exhibitions across the globe. 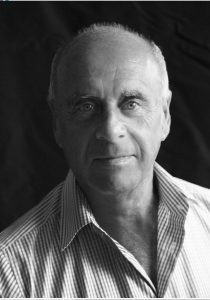 His awards include a John Simon Guggenheim Memorial Fellowship, Leica Medal of Excellence, Lucie Lifetime Award among many others, and in 2002 he was appointed Commandeur de L’Ordre des Arts et des Lettres de France. See more of Ralphs work here.